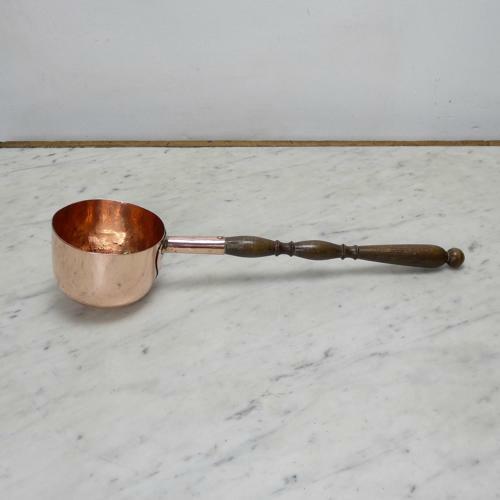 A 19th century copper ladle, or muller, with a long, turned, wooden handle. This piece could have been used either as a ladle or as a muller, for warming ale or wine over a fire. It is made from quite a substantial gauge of copper and it dates from c.1880. The handle is turned from oak and this is attached to the ladle section with a heart shaped, copper fitting. There is a small, brased repair to the copper and the bowl of the ladle is also slightly mis-shapen. Otherwise, it is in good condition.